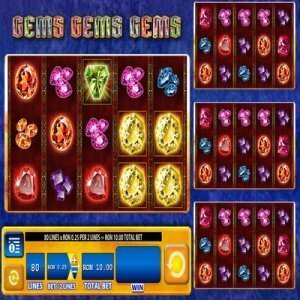 [miau] Gems Gems Gems is a diamond-themed slot game from the Super Pay Multi-Way stable of games. It was made by WMS (Williams Interactive), which is a company that has been making slots since the late 1990’s. This is part of their Innovation Series. The Gems Gems Gems game was a land-based slot before they put a version online in the Spring of 2014. It was popular in physical form for its big bonus round payouts and fast action. That tradition continues with the online version that uses Bluebird2 and Bluebird xD as platforms and WMS+ for software. The game is set up with 80 paylines distibuted along the 4 sets of reels. These reels are divided into 1 set of 5 on the left-hand side of the screen and 3 sets of 5 reels stacked on top of each other on the right-hand side. You activate the right-hand reels by getting Wilds and Scatters on the main reel. There are Wilds and Scatters on the secondary reels as well. Except for the Wild, which is the Gems Gems Gems logo, the symbols are all jewels. They have vividly colored sapphires, rubies, and emeralds. The Scatter is a girl’s best friend: the diamond. If you get 3 diamonds out of all these sparkling gems, you get a free spins bonus round. You get 10 free spins, and your multiplier ratchets up depending on how many reels your Scatters are on. A 3x multiplier applies if you get 3 Scatters on 1 set of reels, a 6x multiplier applies if you get 3 or more Scatters on 2 sets of reels, and 9x multiplier applies if you get 3 Scatters on 3 sets of reels. All 4 reels have 3 or more Scatters? You get a 12x multiplier. If you get 5 diamonds on your main reel, you get your 10 free spins and the chance to win 2x your stake. The free spins round can be re-triggered once. This is done by getting 3 Scatters during the free spins round. The Wild can be pretty exciting, too. The Wilds can stand in for any icon in the game except Scatters. The Wilds transfer from the main reel to the other 3, so getting 2 or 3 columns of Wilds can give you a major win. As you can imagine, the payouts on these bonuses can get big fast. The coin sizes start at $0.01 and go up to $2, and the game lets you bet a 1 coin spread between 2 paylines, making the maximum you can win per spin $80. This would be using 40 coins. The maximum you can win from the game is a healthy $250000. You only need to pay once on the main reel in order to play all 4 reels, which is something of an improvement over some other Multi-Way games that required a person wanting to play on more than one reel to place bets on those other reels. They even have the game in different languages: Portuguese, French Canadian, Mandarin and Spanish. Not that a different language would be a barrier. “Big Payout” tends to translate very well. Between the potential big wins and vivid graphics, this game is fast and lots of fun to play.